This week, we travel south to Baton Rouge, Louisiana. 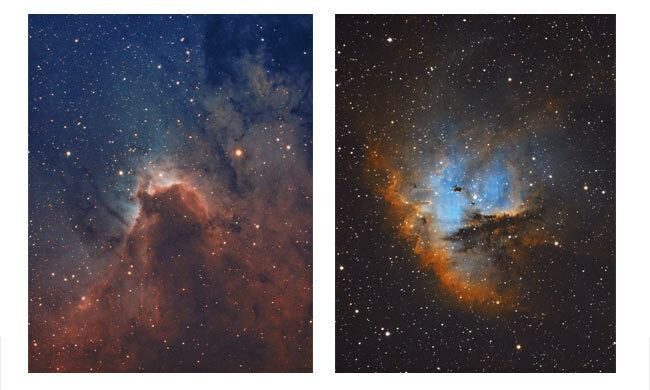 This week’s featured astrophotography rig is owned by a friend of mine, who has made incredible progress over the past year. As you will soon see, he has been able to maximize the performance from this deep sky imaging rig. Fun fact – Rudy was born in Louisiana! 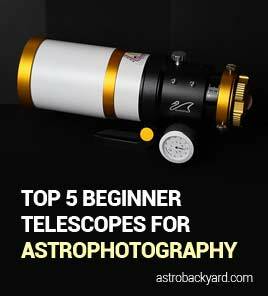 Sean uses a fantastic wide field apochromatic refractor telescope to capture his astro-images from the comfort of his backyard. The Explore Scientific ED127 uses high-end ED glass in a triplet lens design to produce sharp images with tremendous contrast. Just like my 102mm version of this telescope, this refractor was constructed in lightweight carbon fiber. Sean has also installed an aftermarket MoonLite focuser on the telescope, which allows him to autofocus during his imaging sessions. The Explore Scientific ED127 sweeps effortlessly across the sky on a Losmandy G-11 equatorial telescope mount. The Losmandy brand of mounts has somewhat of a legendary reputation in the astrophotography community. The build quality, simplicity, and reliability are unmatched in the market. I sat down with the CEO of Losmnady at NEAF in April, and I can tell you first hand that the attention to detail that goes into the G-11 equatorial mount is impressive. The guide scope used in this configuration is a William Optics GT71. I am no stranger to the lovely apochromatic refractors from William Optics, and the GT71 is no slouch. The Lodestar X2 Autoguider camera delivers precise results when Sean needs to take exposures that exceed 10 minutes. It houses a Sony ICX429 chip which is sensitive enough to guide on the dimmest of guide stars, no matter what’s in the field of view. Sean is devoted to his craft, and has made tremendous progress in a short period of time. 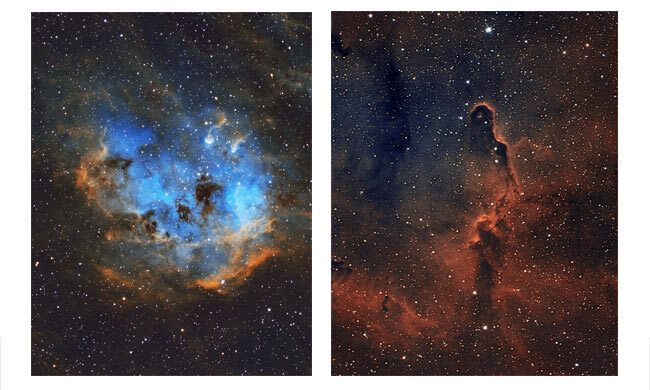 The deep sky images he has been able to produce using this equipment are simply stunning. To view more of Sean’s work, visit his official website www.redstickastro.com. You may have noticed a Red Stick Astro sticker on my fridge in my backyard – Thanks, Sean! 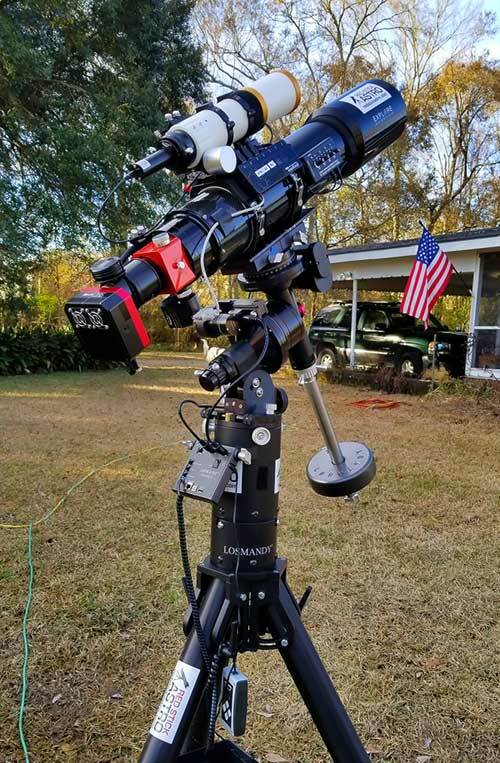 Thank you for sharing your backyard astrophotography setup with us, Sean! Rudy was born in Louisiana! 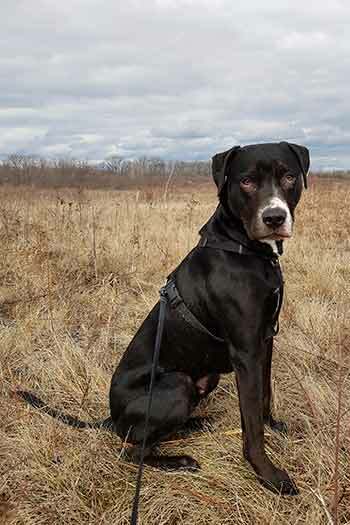 My black Labrador retriever/hound mix was found in a garbage dumpster in Louisiana as a puppy. He was rescued by Boudreaux’s Animal Rescue Krewe (BARK) along with his 8 brothers and sisters. The puppies were each named after Santa’s reindeer as they were found near Christmas time. Rudy (Rudolph) was transported to Canada for adoption and my wife and I fell in love at first sight.